Thursday Night Football is about to get more social. 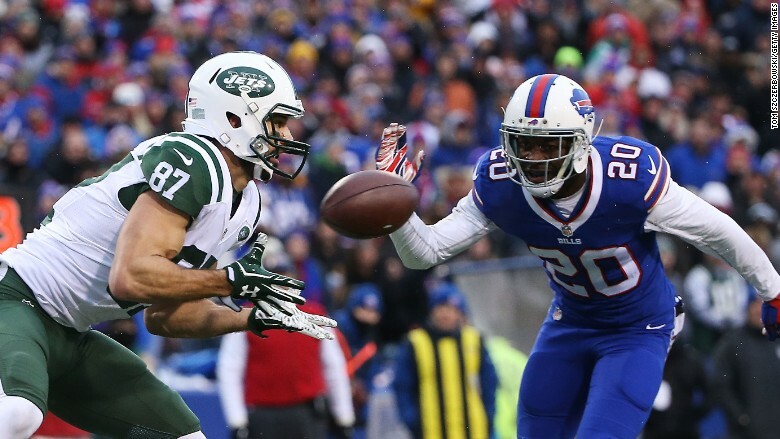 Ten of the NFL's weeknight games will air live on Twitter, beginning with Thursday night's Jets vs. Bills game. It starts at 8:25 pm ET and fans can watch the action on their mobile devices for free straight from Twitter's app. The global stream can be viewed in the "Moments" section of the app or at tnf.twitter.com. The stream can be watched in any country where Twitter operates, except Canada because it has a separate TV rights contract with the NFL. You can also stream the game from Twitter's apps on Apple TV, Amazon Fire TV and Xbox One. The livestream on Twitter will show CBS's broadcast. It will play alongside selected tweets about the action. CBS has the rights to air the first five Thursday Night Football games, and NBC will broadcast the remaining five Thursday night games. Twitter (TWTR), which is paying millions for each game, will also provide viewers with special sideline coverage before and after the game on its live video app, Periscope. The NFL struck a deal with Twitter in April to livestream the games. The deal is a sign that the NFL is keeping up with the times by ensuring that games are available across multiple platforms. Subscribers to the NFL Network can also watch on their smartphones, tablets and computers. Verizon customers can watch on the NFL Network app for free and without using data. Cablevision subscribers can stream the game on CBS.com or the CBS app. The streaming service from CBS isn't available through other cable providers. All of the games are all still available on TV.